Buro Happold Engineering, CEI Inc.
Dr. Tahar Messadi, GTS Inc. Significant constraints and steep topography on site result in a small triangular footprint that informs and influences the form of the church. The scale is adjusted to provide an iconic figure towards the busy highway to the north and a pedestrian scale with a generous entry porch facing the residential neighborhood to the south. Confined by the requirements of parking, access, and topography, the landscape is internalized in a triangular courtyard flanked by the primary circulation routes; a modern cloister. At the apex of the courtyard is the narthex, a place of repose before entering the sanctuary, lit from above with a ribbon skylight calibrated to deliver a threshold of light on Sunday mornings. 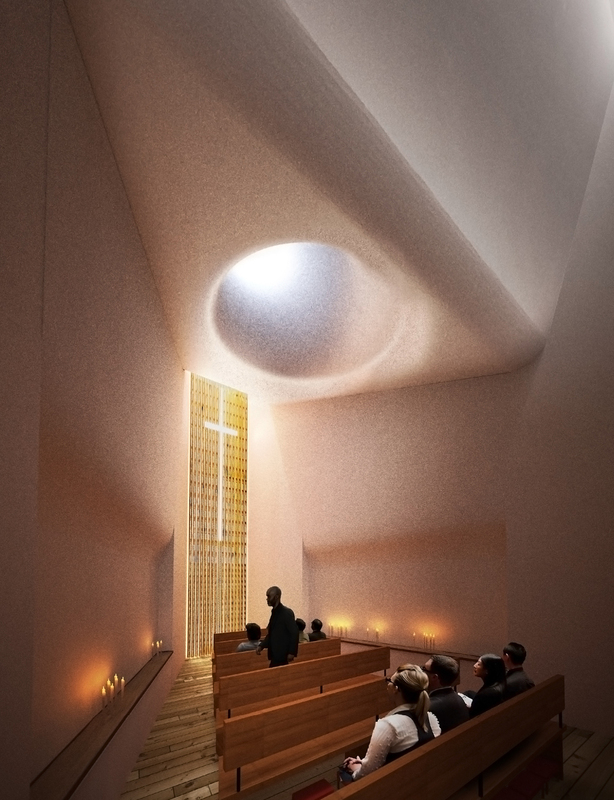 To connect with the larger artistic community centered around the nearby Crystal Bridges Museum of American, spaces for the incorporation and display of art are included throughout the church. As the form projects from the hillside, expansive views of the Ozark hills nearby are revealed, but face east and west so a continuous veil of white perforated aluminum panels wraps the exterior to control the daytime sun. The veil is then backlit to become a beacon at night. The chapel and auricle located within the apex point of the triangular form is accessible from within and also from the nearby trail system as a wayfarer chapel, providing a respite for passersby and further connecting the church to the community.